Hey, our least favorite time of the month – Android distribution numbers update! 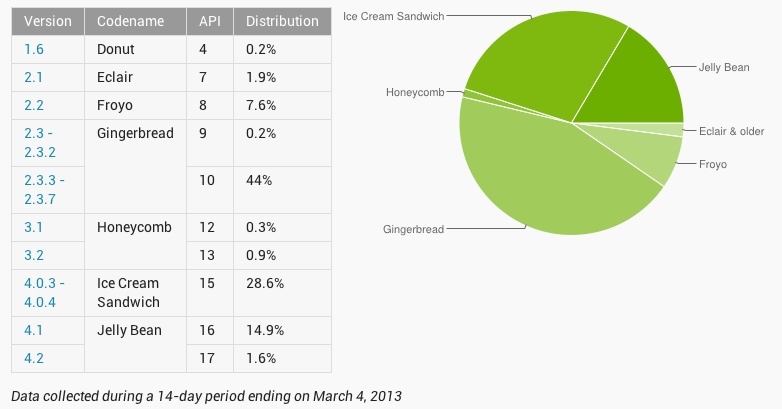 Over a 14-day period that ended on March 4, the Android team has come to the conclusion that 16.5% of Android users are now running Jelly Bean (Android 4.1+). 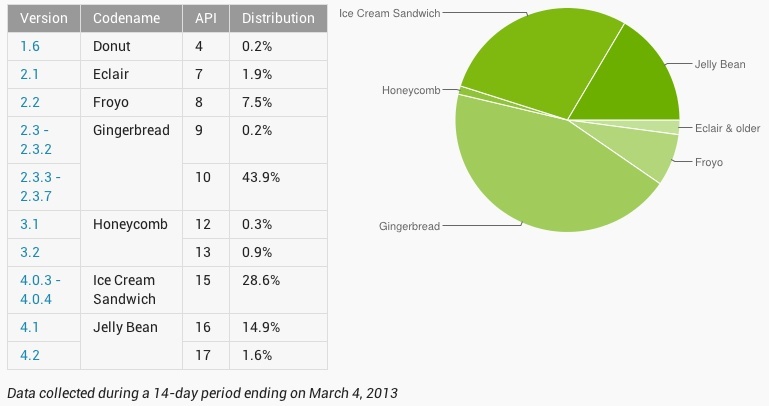 The rest of the numbers look like this – Ice Cream Sandwich (28.6%), Honeycomb (1.2%), Gingerbread (44.2%), Froyo (7.6%), Eclair (1.9%), and Donut (0.2%). Compared to last month, that’s a 2.9% increase for the newest version of Android. We’re also finally starting to see Gingerbread and Ice Cream Sandwich shares take a bit of a hit after what seems like years. That means a couple of things – people are dropping Gingerbread devices and upgrading to new ones with newer versions of Android and that manufacturers are finally starting to update their phones. And cue the Apple blogs with ridiculous titles about fragmentation. Update: Google has tweaked a couple of the numbers. Froyo now sits at 7.5%, with Gingerbread 10 at 43.9%.